Born in Kelowna, British Columbia, Canada, Melissa Williams (nee Wilmot) is the newest member of the Houston Grand Opera violin section. She first came to Houston to pursue a Master’s Degree in Violin Performance at Rice University’s Shepherd School of Music (2012- 2014) with Paul Kantor after completing her Bachelor's degree in Toronto at The Glenn Gould School (with Paul Kantor and Barry Shiffman). She was 13 when she first started playing with professional orchestras and has since performed as a member of the Toronto Symphony Orchestra, Houston Ballet, National Ballet of Canada, Esprit, Saskatoon, and Okanagan Symphony Orchestras. 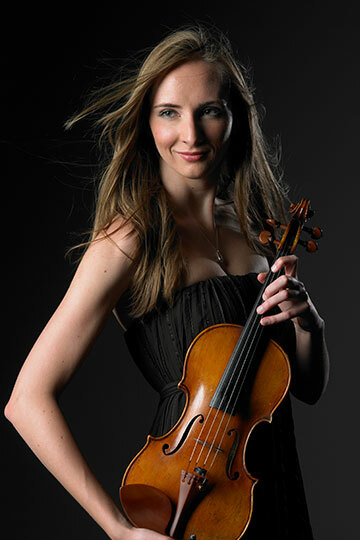 She has participated in the Youth Orchestra of the Americas, Banff Festival Orchestra, Mannes Institute for Contemporary Performance in NYC, and the Tanglewood Music Centre summer programs, and her string quartet was the only North American String quartet to participate in the Kronos Quartet’s professional training workshop at Carnegie Hall. Melissa is slowly getting used to saying Zee instead of Zed, learning to think in Fahrenheit instead of Celsius, and spending almost as much time on the freeway as in the practice room, but is loving life in Houston and is feeling more and more at home all the time. She especially enjoys Houston’s weather, all the green space, and exploring its many trails and parks on her road bike. Also helping her feel at home is her Houstonian husband, Erique. They were married on one of the few days off between Die Walküre performances! Look for Melissa in the pit, likely the only person there with a bright yellow violin case (the closest she’ll ever get to owning that dream yellow sportscar).